There's a news report about Sarah Palin's contract for speaking at the upcoming 50th Anniversary celebration of California State University in June. It seems the university's Stanislaus Foundation has been refusing to provide a copy of the contract in a possible violation of public disclosure laws. But some students somehow heard that the contract was to be shredded and went digging through the trash and managed to find six pages of the alleged contract. I'm going to leave the contract contents aside and focus on something I think is more important. The contract has the "Washington Speakers Bureau" and a contract number printed at the top of each page. 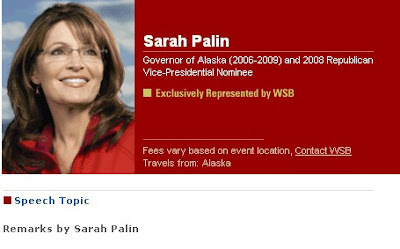 Palin is exclusively represented by the Washington Speakers Bureau, a company whose web site makes the claim of "Connecting with the World's Greatest Minds." Let that sink in for a moment. spending or advancing the cause of special-needs children, Palin speaks passionately on her experiences confronting the issues of our time. She encourages audiences to look to the future and challenges leaders to do more to support our troops, responsibly develop domestic resources, rein in spending and shrink government while calling for a fiscally responsible health care model that benefits all Americans. A powerful, no-nonsense voice for principles and reform who currently serves as a contributor for Fox News, her memoir Going Rogue: An American Life was published in November, 2009 and was an immediate best seller. Now the telling part is what's listed under her Speech Topic. But let's check out some of the other speakers. I looked at over forty other speakers and found that each one of them gives you a very good idea of what you're paying for. Even Christopher B. Duncan makes it clear he is a Barack Obama impersonator. (No doubt he should do well for the next three to eight years.) Pat Riley talks about "The Winner Within". Mary Lou Retton talks about "The Competitive Edge". Both William S. Bennett and Geena Davis each list a variety of topics they can expound upon. Former boxer Sugar Ray Leonard has "The Power to Win". The Capitol Steps will give you "The Lighter Side of Politics". And former fighter pilot Scott O'Grady, at a very reasonable fee code of 2, will talk about how to "Return With Honor". Astronaut Sally Ride will "Reach For The Stars". The point I want to emphasize is that with the 40+ speakers I looked at, some famous and some I've never heard of, you know exactly what you're getting. With Sarah Palin, you're getting "Remarks by Sarah Palin". Can you compare the substance of "remarks" with any of the other speakers' topics? You betcha! But Sarah Palin is not alone in that regard. There is one other mind you can connect with and also get "remarks" from. And that person is none other than former President George W. Bush. Connecting with the world's greatest minds indeed!